How shall we seat you? Today is National Wear Red Day. In honor of Heart Health Month, millions of men and women are supporting heart health by wearing red today. I am in charge of the wellness intiative at work and I've been promoting this all week. The irony? I hate red! Like hate it, with a deep loathing passion. (I don't mean to offensive, just explanatory) I certainly I have no red in my wardrobe, except a paint-covered tshirt. 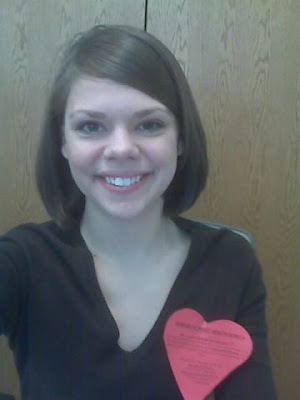 So I pinned a red paper heart to my shirt in order to not be a total hypocrite. ooh, blackberry. why do I look so tired?! I need a day off from all things wedding. Tonight I'm going to clean my disasterous bedroom, do about 4 loads of laundry, watcha movie and get 10 hours of sleep. Tomorrow I will work on invitation wording, purchase paper and start making table runners. or another day. Copy and change the answers to suit you and pass it on. It's really hard to only use one word answers. 7. Your dream last night? scary! 13. Where do you want to be in 6 years? (location, or state of being?) Mommy. 29. Your favorite store? express? 40. What are you doing tonight? laundry! 2. What's your perfect weekend-getaway? depends on with whom. Future hubby? Cabin in the woods and a double sleeping bag! 3. What item on your registry to you want the most, and why? Dyson Vaccuum. Do i even need to explain? 4. Have you ever heard of a Chi-Weeny? If not, can you guess what it is? Yes, Chihuahua Daschund. but not for me! I'm a midsize/big doggy person. 1. Leave me a comment & your e-mail address saying, "Interview me." If you dare. 2. I will respond by emailing you five questions. (I get to pick the questions). 4. You will include this explanation and an offer to interview someone else in the same post. I don't care much for red either, so I wore grey and I'm sporting my Go Red sticker. I love red and it actually is one of the colors that looks good on me but I haven't got a single item of red in my closet! I used to have a red sweater but it got thrown into the dryer. boo. Seriously you can ask anything! That's so sad that you hate red! I bet you hate visiting my blog then lol. At least you were a good sport about it! !